Earlier this week my husband and I were watching the news when he received a text message from me. The only problem was I hadn’t sent it and no one was using my computer. My son was in his room and yelled down the stairs (yes we’re one of those families) that my email was hacked. At the same time I received an email from Mrs. Accountability telling me the same news along with some steps to take immediately. This is a list of actions to take that includes the suggestions from Mrs. Accountability, Google and me. 1. Change your Password. Fortunately I was logged into my email account and able to access the account settings and changed my password immediately. 2. Update Account Recovery Information. In case the hackers had gotten my account recovery information, I changed the recovery email account (I have way too many) and the security question. 3. Turn on Two Step Verification. This option with Gmail means you have to provide information sent to two different account recovery options. This makes it harder for hackers to request your password by only knowing one data point. 4. Notify Contacts. I could see in my sent mail who received the spam message sent from my account. I sent an email to all informing them my account was hacked and to please ignore the message they received. I also apologized. Everyone I’ve heard back from has been very gracious. 5. Check List of Websites with Access. You know some sites or apps that request authorization to access some account such as twitter or facebook. I have approved several for email as well. Review the list and remove any that are no longer applicable. 6. Check Last Account Activity. 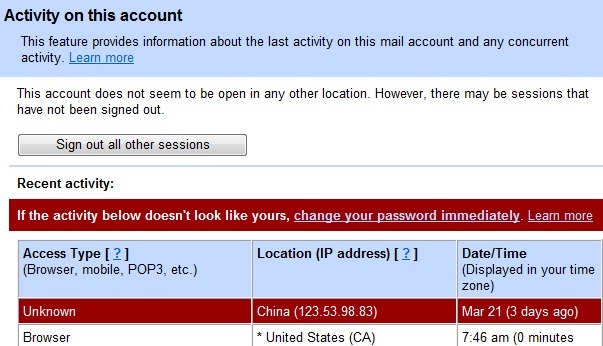 As you can see in the picture, my account was accessed from China. As much as I want to visit that country, I haven’t yet. I don’t know what to do with this information! 7. Don’t use Public Computers. I must confess to doing this often to check emails during my travels for business and personal. If you have no alternative, change your password immediately after using any public computer or use an account that is set up just for this purpose. I hope I’m done with this experience. I’m changing the passwords on all my online accounts to include more complexity (and no dictionary words). Have you ever experienced your accounts being hacked or do you have another tip? Unfortunately I have had an account hacked recently as well and it is no fun! Glad you got it all taken care of so quickly! I would add – scanning your computer with 3 different scanners to make sure the culprit still might not be on the system. Wow, sorry to hear. It’s great that you reacted so quickly. No new tips, just make sure to sign out properly from public computers and use strong passwords. Good Luck. Sorry that you were hacked. 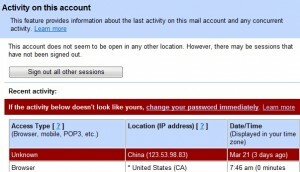 My wife and I both had our email accounts hacked within a week of each other. We both use public WIFI frequently. Could they have gotten in that way? We now both use passwords with numbers, letters and symbols and change the passwords every few weeks or so. Luckily, neither one of our accounts contained any financial information – but now they know, something about us and where we live, which is uncomfortable. @ Laura, thanks for the support. @Melrose, You are right that it’s not so fun. I was lucky to find out so soon! @ Evan, good point to scan the computer. My scans have come up clean. @ Buck, the public computer tip is well worth repeating. @ Alan, I use public wifi when traveling but can’t avoid that. I just know now to be hypervigilant. Sorry you both had to go through this as well! Wait… so you didn’t send that email out?